I've been watching several analogs for the past several weeks, and this is one screaming the loudest just now. As always, an analog makes a lot more sense when there's a plausible case to be made for the expected path forward. That was certainly the case last year, when I posted extensively about the 2007/8 as 2000 analog [see: OMG, WTF and Money Back Guarantees and Happy New Year.] I believe this one qualifies, though there are a few hoops to jump through first. The odds of it playing out rise dramatically if the bump we saw Wednesday extends up to 1380-1400 before any further declines. If so, the bold purple dashed line above -- the midline of the channel I expected would stop Tuesday's sharp sell-off -- would make a terrific neckline for a H&S pattern that targets 1305-1317. The H&S pattern is key. If the neckline holds -- probably around April 24-26 -- the H&S fails and we head up to 1462-1472 around May 4-8 for the end of the bullish ride. 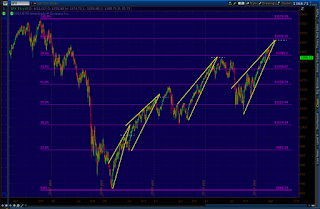 Likewise, if we see no reversal by 1430, the H&S busts and we're practically guaranteed an immediate new high. 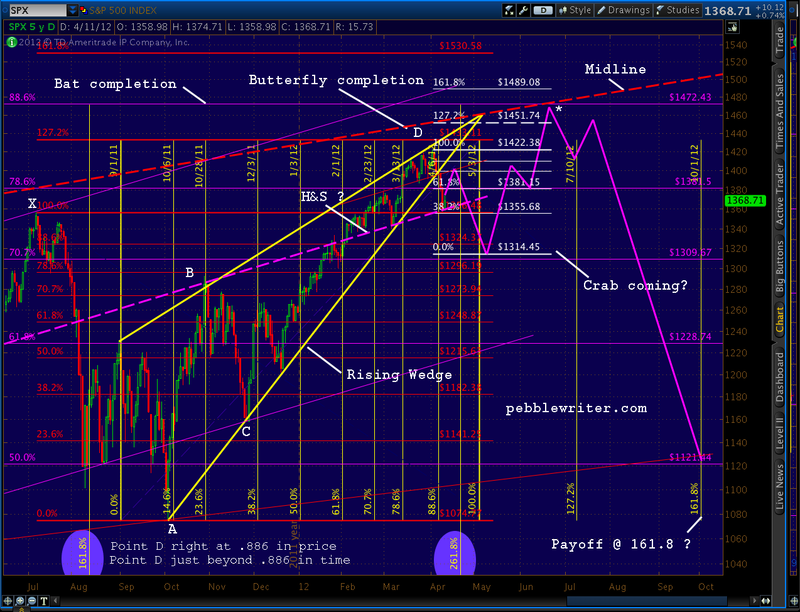 To me, a drop to 1305-1317 seems fairly plausible. 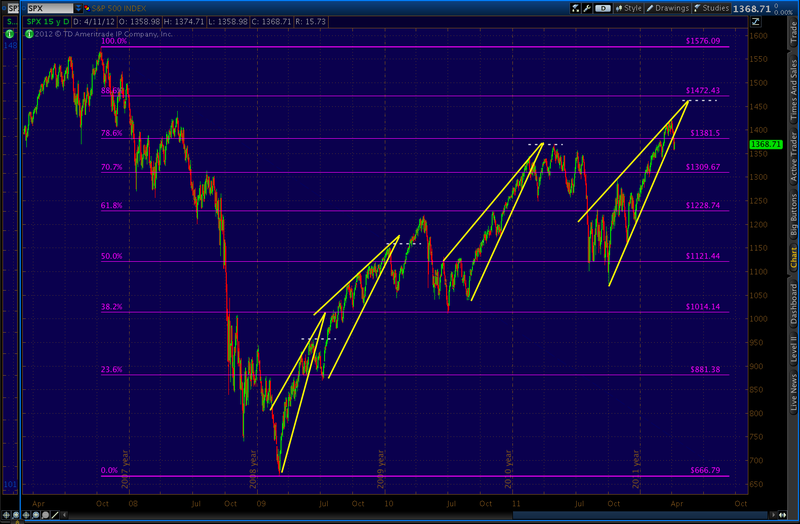 The tricky part comes in calling for a reversal after SPX has fallen 120 points from its recent high. The timing looks to be early May, and we have a couple of Fed-centric events around then: consumer credit on the 7th and minutes from Apr 24-25 on the 16th. So, I suppose anything's possible. If the analog is still in play, this is make or break time. Those who, like me, have been resolutely bearish are itching to get the party started. Sentiment would be fiercely negative. But, a strong bounce around 1300 would be the signal that the analog is good. If so, we're likely to go back and tag the price level of the original apex (about 1462) of the rising wedge we've been in since last August. I've seen this phenomenon play out again and again on both large and small scales. 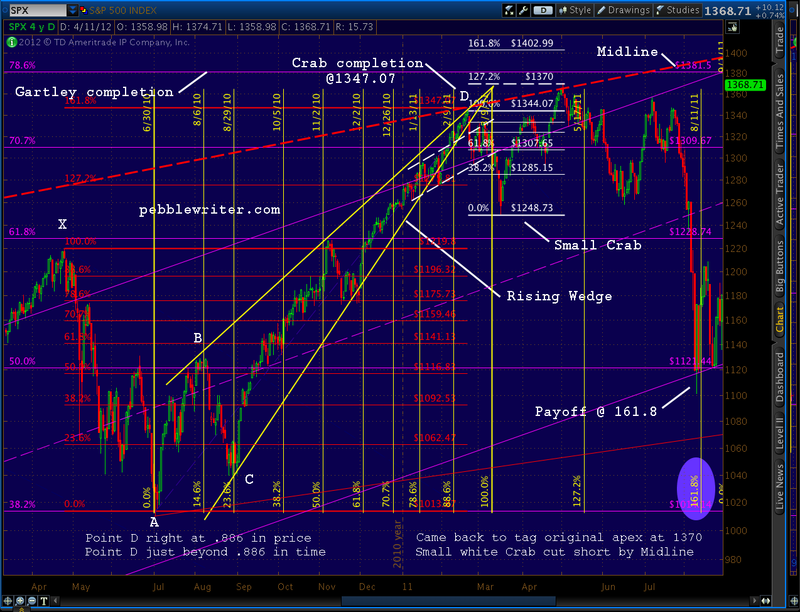 While completion of the Crab pattern which might set up by then would indicate potential to 1489, I believe the .886 Fib of the Oct 07 - Mar 09 decline (a Bat pattern) will step in to prevent a rise in excess of 1462-1472. If all those fairly logical (but, by no means guaranteed) pins drop into place, the lock will click and the door will swing open to all sorts of fun stuff. I'll be watching it along the way, of course, waiting for the whole mess to come crashing down in a heap. As I mentioned, there are other analogs at work that have potential. One of them really knocked my socks off, and I'll probably post it this weekend -- perhaps on the new website. Yep, it's finally up and running. I'm populating it with charts and articles in my spare time, so the grand opening is still a few days off. I look forward to your thoughts. Very nice work PW. 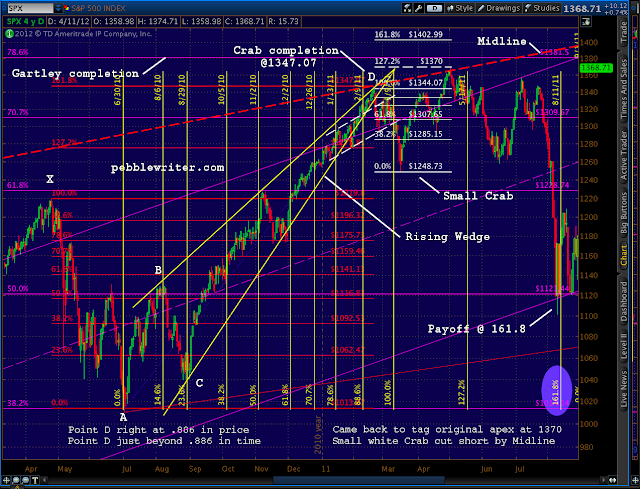 I am looking at the H&S forming on the RUT as well and feel that is an important pattern. Thanks for your work. I really appreciate your views and analysis. best of trades to you. we tag your target area of 1380 today, maybe a little more upside before a trip down to 1305-1317, am I reading your article right? Thanks for your work. Compelling stuff & excellent presentation! 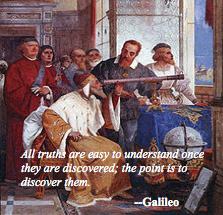 Your red "midline" reminds me of marketanthropology.com's "Market Meridian." Same color even. Thanks, TRB. Excellent point on RUT. A normal backtest of the broken rising wedge will make for a very nice H&S. Looks like 720ish.